Are you a developer, UX enthusiast, big-ideas person, or effective team leader? Register now for the 2017 Hesburgh Libraries Hackathon – a timed, competitive event where teams with diverse skills and talents create innovative digital solutions. This year’s theme is Information Overload. Do you have creative ideas to deal with the 24/7 problem of information overload? Do you want to create innovative solutions that will have an impact on research, academic, or student life? Find a two to four-person team and register for the event. During the event, students identify a challenge or need caused by “Information Overload”; plan, design, and build an innovative solution; and document and present their solution to a panel of judges. Teams showcase their projects in 5-minute lightning talks, with the top entries garnering awards. The 2017 judges represent expertise from several areas across campus. 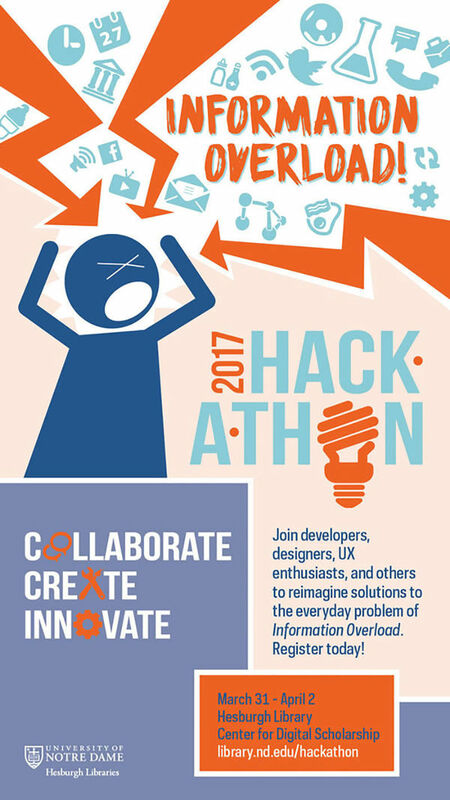 Download the 2017 Hackathon flyer. Originally published by Tara O’Leary at conductorshare.nd.edu on March 17, 2017.